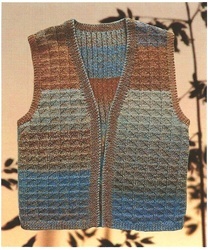 A very subtle pattern that is well-suited for men in a variegated yarn. The back is knit in k2p2 rib to keep it close fitting, and the fronts have the flag stitch. 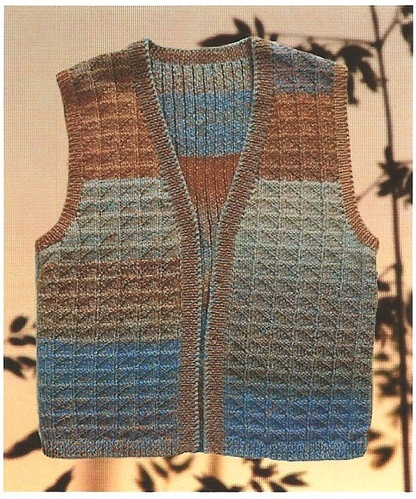 The pattern comes in 4 sizes, with finished measurements of 40" (44", 48", 52"). Has short row shoulders and neck band picked up and knit. Small size takes 8 balls, add a ball for each increase in size. See the Rhythm colorways here. Your feedback is always appreciated. Write your own review.